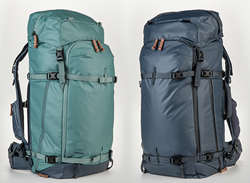 Shimoda is partnering with Tenba to launch the next evolution of the adventure camera bag: an all new system containing 40 and 60 sized backpacks with modular Core Units, multiple Accessory Cases and a Carry-On Roller. Having stable logistics, supply chain and operations support, while dealing with a team who operates as a family, has me extremely excited for the future of Shimoda and adventure photography. Both the Explore 40 and Explore 60 backpacks utilize modular Core Units and multiple sizes of Accessory Cases to let you fully customize your shooting experience - not only to your gear requirements - but the terrain ahead of you. They can be combined to create over 10 different configurations to satisfy numerous gear carrying needs. Whether you’re camping out waiting for an epic moment or touring up a crevasse-riddled glacier, our system allows you to choose the most efficient camera access for the situation – even on the fly. Since 1977, Tenba has been making innovative carrying case solutions for professional photographers and filmmakers and their full equipment arsenal. To find more information about the Tenba Messenger bags, visit http://www.tenba.com.